Do you have ancestry in the Broken Hill area? 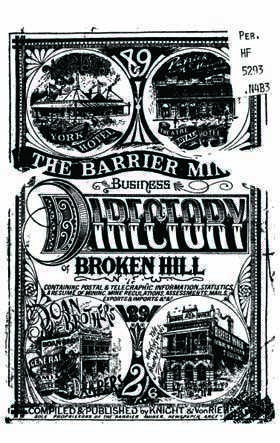 With a population of approximately 20,000 by 1891, it was felt that Broken Hill needed a Business Directory. The local newspaper, 'The Barrier Miner', came to the rescue and published the very first 'Barrier Miner Business Directory' in 1891. With over 200 pages, this directory covers everything that is useful to those living in Broken Hill, Silverton, Round Hill, Thackaringa, Purnamoonta, Pinnacles and Cockburn. In addition to the alphabetical list of householders (street-by-street, with occupations), it also contains a brief history of each region, details of government officials, sporting club office holders, society office holders and more. It's a treat for social historians! This is a terrific genealogy tool for foe exploring a family history in the Broken Hill area and building a family tree.